It could be argued that Hollywood has survived worse challenges than the rise of Netflix and its fellow streaming services. The introduction of television sets in the 1940s should have triggered an extinction event for cinema with television offering more rapidly updating content and expediency, ushering in the age of home viewing. The effect of home viewing was dramatic on cinema in the US, with weekly attendance dropping some 85% between 1946 – 1964. However, Hollywood survived by cutting production from around 500 to 150 films a year to finance increasingly spectacular and expensive tentpole releases: beginning with the lavish historical epics of Ben-Hur, up to the multi-billion-dollar shared universes of Star Wars and Marvel’s Avengers in the modern event-movie era. The home viewing thorn in cinema's side has only dug in deeper since the advent of television, with the introduction of home video, DVD, and large flat screens. Yet the Hollywood business model that emerged from the threat of television survived relatively intact, mostly because films studios retained control of production and distribution for what was still widely seen as the most spectacular and reputable content. Those home viewing innovations became another delivery method to recycle such titles - once they had fulfilled the most lucrative cycle of their release in cinemas. Initially, it seemed the arrival of online streaming would provide Hollywood with another avenue for home viewing distribution. It proved to be a remarkably successful method with the likes of Netflix giving viewers instant access to Hollywood's hand-me-downs for a relatively cheap monthly fee, further increasing film studios' reach to add a new cycle to titles' lifespans. More importantly, the studios retained control of what and when content could be distributed on the online platforms. That is until Netflix gained its own means of production and began to compete directly with the studios - not only for audiences' attention and expenditure but also, for Hollywood's most prestigious prizes. But some have begun to question whether Netflix deserves those prizes when the streaming service refuses to fully engage with the Hollywood’s theatrical release model. Alfonso Cuaron’s semi-autobiographical “Roma” has proved to be a landmark achievement for Netflix in the platform’s quest to be recognised as a viable force in filmmaking. After several years of sitting at the fringes of Hollywood’s top table with releases like Beasts of a Nation and Mudbound, Roma dominated this year’s Academy Awards with ten nominations, three wins and being considered the front runner to take home Best Picture – right up to the point when it eventually went to Green Book. It is an unqualified success story for the streaming service but that has not stopped a spectre at the feast manifesting in the unlikely form of Steven Spielberg. The beloved director has seemingly become uncomfortable with Netflix’s heavy presence at this year’s awards while having very little presence in cinemas and has begun a petition to change the qualification process for the Oscars. The current Academy stipulation for consideration is a feature film must be released for at least one week in an LA theatre. Spielberg is seeking to change this to a 90-day theatrical run, which would make untenable Netflix’s current theatrical-release strategy of renting screens directly – or a “four-walls” arrangement - to show its titles theatrically to meet the minimal Academy criteria for consideration. It is worth noting that Roma did receive a three-week exclusive cinema run, something that seems to have been appreciated by movie-goers. Through conversation analysis of those discussing seeing Roma on the big screen, we can see below their response was mostly positive. However, the brand attachment (seen below) for the release was particularly strong for Netflix, which would have likely meant that many viewers were waiting for the title to drop on the streaming service. It is exactly this strong brand attachment that has made Netflix, in particular, a target for those that subscribe to Spielberg’s stance. When we look at the conversation generated by Amazon’s awards-darling Manchester by the Sea from 2016, there is seemingly no audience awareness of Amazon’s involvement and therefore little audience expectation that a streaming release was imminent on Prime Video. Amazon is not seen as a disruptor in the current Hollywood model simply because they are adhering to it with its original productions, such as last year’s Suspiria remake, being released into cinemas in the traditional “day-and-date” release window of theatrical exclusivity. Interestingly, it has recently been reported that Amazon will be moving its film production into bigger budgeted projects in favour of its acclaimed indie productions so far. Whether these will be used to compete with Hollywood at the box office or to increase the potency of its streaming service’s appeal by adopting Netflix’s model remains to be seen. But with Amazon Video Prime being a service within the vast online shopping mall of its parent company with both subscription titles and over-the-top sales present on the platform, either direction could suit the platform. This is not a choice that Netflix has the luxury of. Netflix is a streaming service first and production house second. Despite a vociferous output of original content, with a reported cost of $15 billion for this year alone, the platform still relies heavily on licensed third-party content. According to reporting on analytics by Jumpshot, more than half of the 50 most popular shows on the platform are licensed to Netflix. But this era of recycling popular third-party content is likely ending for Netflix, as those third-parties venture into online streaming themselves. If an exodus of third-party content lies ahead for Netflix, then there is a worrying preference in the service’s audience attitudes towards the removal of favoured titles according to survey data EntSight gathered from GlobalWebIndex. As seen above, and as was established in an earlier EntSight article, value is still the main drive for subscribers so increasing the quality and quantity of original content to replace departing third-party titles will be vital for the service over the coming years. As such, starting to disseminate their most esteemed film content such as Roma from Netflix’s ecology into the current day-and-date release cycle that cinemas favour could be a doomed strategy. In terms of the quandary put forward by Steven Spielberg, it could come down to an uneasy truce between the Academy Awards and Netflix. The dwindling TV ratings of the Oscars suggest a drift towards obsolescence which could be halted by the inclusion of Netflix content that a vast audience of nearly 140 million subscribers has instant access to. This particularly applies to future audiences due to demographic skew towards under-35s amongst Netflix subscribers. This year’s Academy Awards sent out a clear signifier to audiences that Netflix is producing quality content. With ten nominations for Roma, the three-hour broadcast partially served as a feature-length advertisement for quality output on the streaming service. And it is these gigantic explosions of attention that Netflix seems to favour for its major film releases. Despite Netflix’s reluctance to engage with cinemas, it seems the service still needs to be able to produce the “event films” on its own platform that Hollywood used to stave off the threat of television. We saw this ability play out in real time in January last year when Netflix usurped the Super Bowl half-time ad break by announcing the immediate release of the latest film in the Cloverfield franchise. As we noted in our article on this unprecedented publicity stunt, Netflix sometimes likes to ring the dinner bell through a fog horn to attract subscribers to engage with what the platform believes is its most viable titles. We also saw the same effect with Netflix’s first foray into genuine blockbuster territory, 2017’s Bright, which saw a huge spike in conversation around its December 18th release, with very little either before or after its online premiere. So, while audiences may rarely get the opportunity to see a Netflix film in a cinema, they seem to still treat them as an event. It also appears that a Netflix film premiere can rival the conversation peaks of a traditional cinema release as well. Perhaps the real test for Netflix in potentially distributing its original films via a traditional theatrical release is yet to arrive in the form of Martin Scorsese’s first Netflix production, The Irishman. 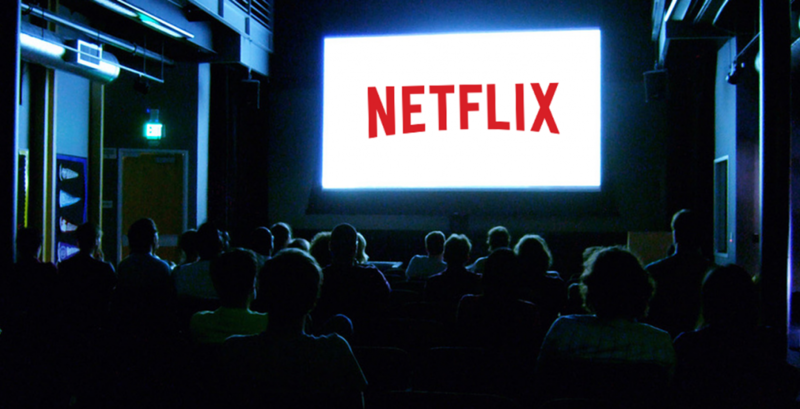 The $125 million-budgeted production may produce enough clamour among audiences to tempt Netflix into a lengthy exclusive theatrical release. Such pressure would increase dramatically if the Academy does secede to Spielberg and decide to play hardball with the streaming service for a release with huge award potential. However, it may well be in Netflix’s best interests to adhere to serving its subscribers rather than Hollywood. With the streaming market becoming an increasingly crowded space - particularly the imminent threat of Disney’s digital platform - and the expected exodus of the third-party content that has contributed so much to Netflix’s success, it would not be without irony if Netflix used its own platform to generate event-films to stave off Hollywood.